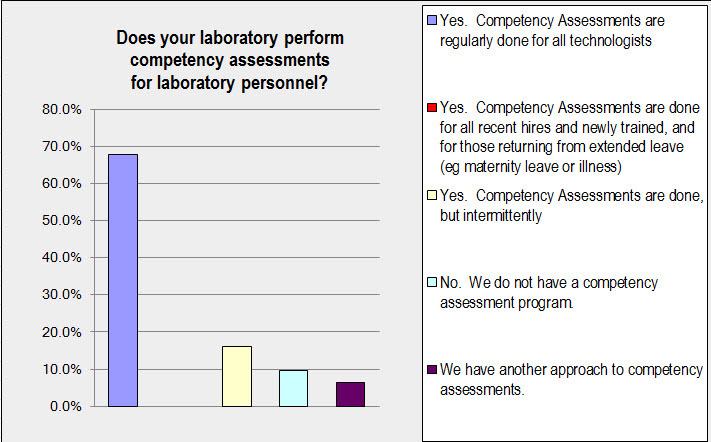 Making Medical Lab Quality Relevant: Competence Assessment: how regular is regular? Competence Assessment: how regular is regular? By now most readers of MMLQR know that I buy into the concepts of Quality and that I follow Quality Management practices in my laboratory and academic practices. But I also see it as my obligation to understand and interpret Quality and apply it to the extent possible and to the extent reasonable. To my way of thinking, embracing the limits of possible and reasonable creates an atmosphere of achievability. Going beyond that is like starting on an exercise program by running a marathon every day. You can do that once, and maybe even do that twice, but at a certain point it ceases to be sustainable and falling off track becomes unavoidable. The challenge is to find the level that works for you and your organization from which you can build going forward. This is not a bad idea. One needs to be confident that people that are working in your laboratory know what they are doing. And the concept of reassessment at “regular” intervals as opposed to “annual” intervals makes competency assessment more likely to be a program that can be sustained. Recently I did a routine on-line survey of the laboratories that participate in our Clinical Microbiology Proficiency Testing program, which is a pan-Canadian proficiency testing program that is committed to clinically relevant proficiency testing. One of the questions I asked was about competency testing because I wanted to know if laboratories used CMPT samples as part of their competency assessment process. The first question that I asked was “Does your laboratory perform competency assessments for laboratory personnel?” to which I gave 5 choices for response. You can see the results in Figure 1. I will tell you that in my opinion, while most responders (67%) said they did so on a regular basis, I personally was hoping that more would have selected the second choice (new trainees, new hires, and return from absentee). Surprising to me, not a single responder selected this choice. While it is true that choice 1 was much closer to the letter of the regulation, the second choice is much more practical and pragmatic; in my opinion, it is still an acceptable option. In my laboratory all my staff have been with me for a long time, well in excess of 12 years. In Canada that is pretty typical of most laboratories. All staff were trained well at the beginning and have grown into the positions; they are experts in what they do. By all the measures that we follow (contamination rates, late rates, complaints and complements, sustained contracts versus lost contracts) they do very well. We have had people take prolonged maternity leave (in Canada employees can take up to one year off for parental leave), after which they underwent retraining and reassessment. In CMPT I do not bother with routine or “regular” competency assessment any more, except for special cases. Rather I focus on output and performance. In my world, it is true that some people can have life challenges, with drugs (including alcohol), or illness, or stress/anxiety all of which can impact on performance. For some, the onset may be insidious, and may impact on work may be gradual or subtle. But the reality is that most people don’t go through crisis and even when they do, competency assessment is far to blunt an instrument to rely upon for picking up subtleties. In other words, in my world, once we have gone past the point of recent hires and retrains and those who take extended leave, having active competency assessment, even on a “regular” basis can be excessive. All activities are Time, Effort, Energy, and Money (TEEM) consumers, all of which are finite in the medical laboratory. Running competency program for all personnel takes a lot of time and effort and energy. And I find that that those of assets that I can better consume in other meaningful Quality oriented activity. Having an intact program is important, but so is picking your battles, and maintaining your options. It is as much about balance as it is about requirements. So when the discussion comes with the accreditation auditor, I suggest that laboratories understand that the crafters of the standard signalled the need for flexibility in Competency Assessment by using the term “regular”, and that it is your prerogative to explain and justify how you have interpreted and used that flexibility to your laboratory’s advantage. It is up to you to sort out how you measure performance and how regular “regular” has to be. PS: For more discussion on Competency Assessment, consider attending the POLQM Quality Management Conference for Medical Laboratories. Health care charging in addition to code program accessible on the internet are increasingly being grouped since a type of remote mastering and over herePupils could get your program wherever they will are living. There are many advantages to internet-based courses. People can work and travel, now almost anywhere in the world, and still stay connected to the course. Also because our discussion process which is very active is set up as asynchronous meaning that participants can work in their own time zone. We have had participants from all over the world taking our course at one time on another. While it has its challenges, I think that having Quality discussions with folks from China, Central America, Europe, the middle East, and North America is a huge plus. Running a MOOC - running a muck?